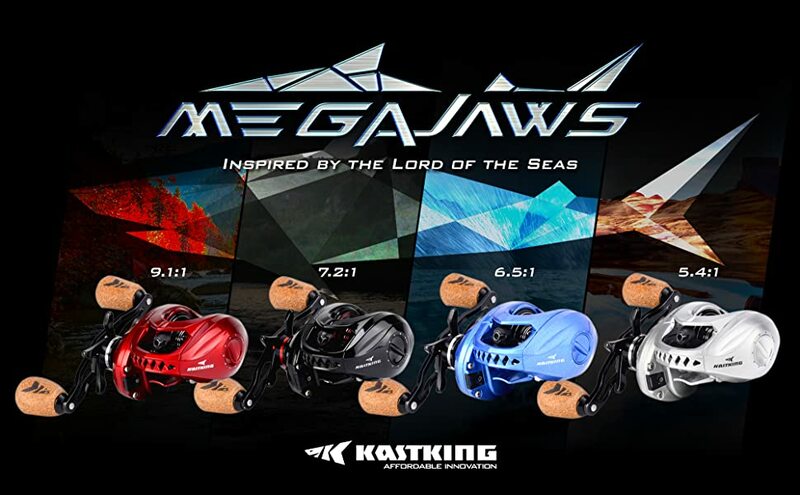 MegaJaws – Inspired by the most powerful sea predator, the KastKing MegaJaws baitcasting fishing reel conveys essential shark elements that represent the power and strength that sport fishing anglers desire today. The shark tooth front hood, shark fin side covers, and rigid metal components will consistently remind you the sense of dominance and the total confidence on the water. Super Long-Cast System & Slick Design – The MegaJaws unique KastKing LFTV (Low Friction Tapered Vortex), funnel shaped line guide greatly reduces line friction, giving you super long casts. MegaJaws casting reel adopts the same palm perfect ergonomic engineering as the Royale Legend Elite. Its low-profile frame fits comfortably in the palm of your hand. MegaJaws is a compact, palm sized baitcaster that reduces fatigue for all day long comfort. Cast after cast, you will feel the difference. Color-Coded System – KastKing knows how difficult it can be to quickly identify a specific gear ratio reel on the deck of your boat for a specific fishing application. KastKing has given the MegaJaws unique colors for each gear ratio so you can quickly identify the right reel for the job and gain a competitive advantage to win bass fishing tournaments. Select from 5.4:1. 6.5:1, 7.2:1, and one of the fastest ratios in the market -- 9.1:1. Powerful Components – MegaJaws bait casters are full featured, tournament ready reels in every way. 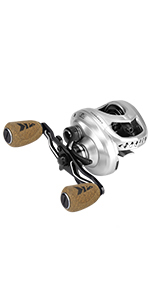 11+1 double shielded stainless steel bearings throughout; The manganese brass pinion and main gears and a nickel-coated brass worm drive gear provide strength, durability and consistent performance for freshwater or saltwater fishing. Its ultra-smooth carbon fiber drag uses multiple carbon discs providing up to 17.6 lbs of fish stopping power for hard fighting trophy fish. Attention to Detail – Command your fishing situation with CNC Aluminum spools for amazing casts, a powerful aluminum handle with comfortable rubber cork knobs, and a spool tensioning knob with click stop adjustments. The unique MegaJaws magnetic casting control system features 8 magnets with 10 adjustment settings that control backlash and overruns. 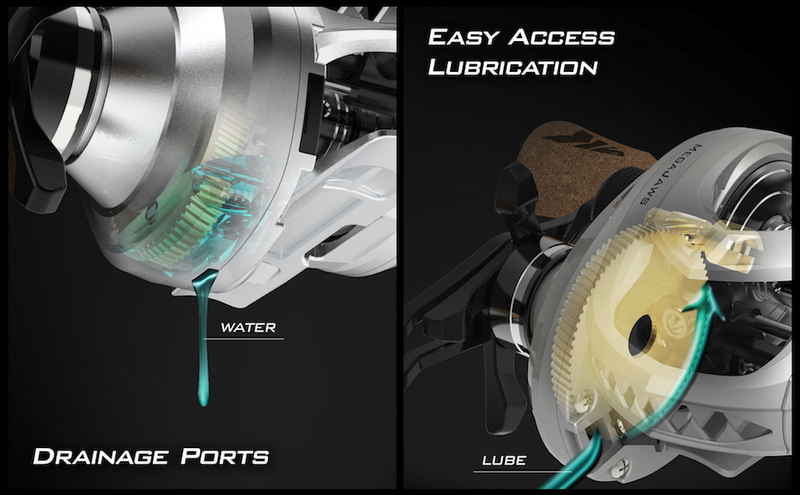 Easy access lubrication and drainage ports provide long-term performance and simple maintenance. 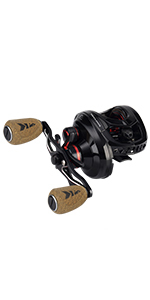 We’ve created an apex predator baitcasting reel with the new shark inspired KastKing MegaJaws! The KastKing MegaJaws casting reel is a fully featured, tournament ready bait casting fishing reel that will provide years of performance in both fresh and saltwater fishing. 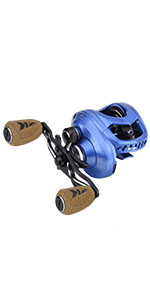 MegaJaws key feature is the color-coded gear ratio system allowing anglers to quickly identify specific gear ratio reels for certain fishing techniques and conditions. The MegaJaws is available in 4 different gear ratios - 5.4:1. 6.5:1, 7.2:1 ad a super-fast 9.1:1. Each gear ratio has its own body color, so you will quickly be able to identify the right reel for the job and fish more efficiently. MegaJaws has high-performance, double shielded, stainless-steel ball bearings (11+1) and uses manganese brass main and pinion gears for strength and durability. The worm gear is nickel coated brass for long life and superior performance. When it comes to fish stopping power, you’ll love the powerful carbon fiber drag washers that eliminates frustrating and inconsistent drag tension. They deliver a maximum drag power of 17.6 lbs so you’ll always be in control of even the largest fish in tough conditions. MegaJaws is easy to cast! The Super Long-Cast KastKing LFTV (Low Friction Tapered Vortex) System with a funnel shape line guide provides a wider angle for the line to go through and effectively reduces friction for longer casting performance and reduction of overruns. MegaJaws braking system has 8 magnets and 10 levels of control for any size baits in all conditions to avoid overruns and backlashes. In addition, the spool tension knob has click adjustment stops to maintain their setting to deliver an even higher level of control over the speed of the spool to increase distance and eliminate overruns. The KastKing MegaJaws baitcaster fishing reel has high performance features such as a CNC aluminum spool and handle, rubber cork handle knobs for comfort and a lightweight graphite body for all day long performance. This reel is one smooth operator,compared with my ambassador this reel is a great buy. Small but big in performance! Excellent reel for freshwater and inshore saltwater. Very light, adequate and smooth drag even for 10-20 lb stripers. Casts easy and a long way. Can fish all day with it ...no problem! Lined it up with some 50lb power pro and a vudu shrimp and casted like a pro. Really had to try to get this thing to backlash by really backing off the brakes which was a pleasant suprise . So far so good! Loved the reel. Bought this one for my son and bought the red high speed one for me. Love the Kastking products. Great quality and affordable prices.